From the So Real to Surreal department... AustinSurreal Presents and Bavu Blakes hosts What To Say Bout MLK @ Flamingo Cantina on Jan 20th... featuring Grimy Styles, Zeale 32, P.P.T. and Gerald G.
Over the last three years, Grimy Styles’ innovative approach to purely instrumental dub roots reggae has made them one of the most popular draws in the competitive Austin live music scene. Applying the traditional dub techniques of King Tubby to an array of influences spanning classical, roots, jazz and metal via cutting edge mixing techniques and unique onstage signal processing, Grimy Styles realizes a bold, panoramic vision of dub. While their dynamic live shows always get bodies moving, their melodic, imaginative soundscapes amply reward the careful listener. Formed as a trio in 2001, Grimy Styles travelled through a vast number of genres experimenting with the concept of producing pertinent pop instrumentals. The nature of the style was so diverse that in the course of one year the band shared the stage with Bernie Worrell, the Skatalites, and Thomas Mapfumo. 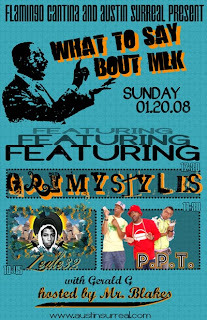 Aside from home studio concoctions, Grimy Styles released there live debut, Restoration of the Bathhouse, in 2004. Regardless of the EP’s shorter length and lower-fidelity the album was a staple amongst the Austin dub scene and played true to the gritty sounds of Grimy Styles’ live presentation. While currently expanding their touring range, the band recently-released Rewind, and plans to spend most of 2007 back on the road, bringing their evolutionary dub to every corner of the globe.